As seen on recruits during 6-mile runs in warm weather, calisthenics, weight lifting and other workout activities. Easy movement, with plenty of room to stretch. And moisture-wicking lining for long-lasting comfort going the distance. 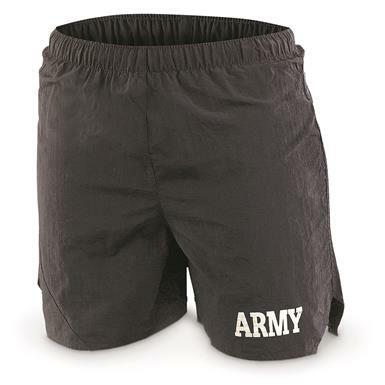 U.S. Army Surplus PT Shorts, 3 pack, Used is rated 3.5 out of 5 by 2. Rated 3 out of 5 by Chattreb from Runs small Buy one size up if you have a 40 waste. Rated 4 out of 5 by dutch from Not bad I like the looks for these shorts ,but got the wrong size so they are very tight in the waist . Will make do . They have a liner like swim shorts . They have that small pocket in front that you put keys in .